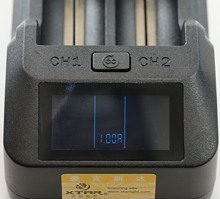 Xtar has made some good LiIon chargers, this is their latest model, introduced in January 2013. It has two channels each with a voltmeter and 3 current settings. It comes in a box made of plastic with a view to the charger and specifications on the back. In the box is the charger, a power supply, a car adapter, a instruction sheet and a warranty card. The power supply I got was with US plug, but universal voltage (100-240VAC 50/60Hz). 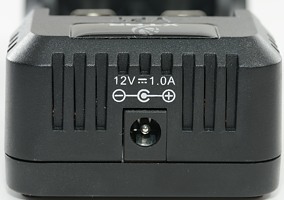 The charger has a DC connector for power input. 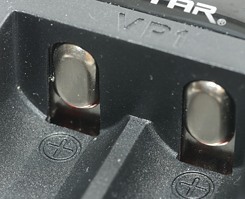 The slots has raised battery connections, i.e. flat top batteries can be used. The slider works very smooth, with 16340 batteries the pressure is a bit low, but enough to get a connection. The maximum length is enough to take my longest battery, i.e. more than 70 mm. There is also a clear marking of polarity. I will say that these slots work very well for the supported battery sizes. On the top of the charger is a switch to select charge current, it can select between 0.25A, 0.50A and 1.00A, the current will be the same in both slots. The display is the a new feature for Xtar and with the exception of hobby chargers, I do not know of other chargers with this resolution. Everything is, of course, shown on the display and not with leds: The voltage of each battery, the selected charge current and the charge state. I have found two minor cosmetic details with the display. The first one is the background lightning, if the display is looked at from most angles it has a bright white border. 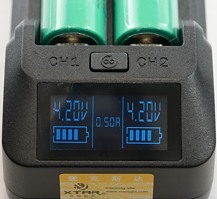 The second detail is the "charge finished" signaling, there is no indicator to show when the charge is finished, you have to look at the fill state in the battery symbol, when all five bars are steady, the battery is finished. I would have preferred a more clear indication. The voltmeter has a good precision, when charging it will show slightly above the battery voltage, as expected. Sadly it will not really work above 4.20 volt (It will show one value and then stop updating). 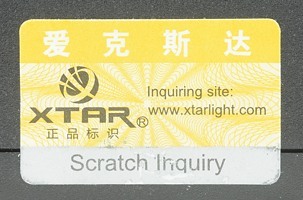 Xtar has recently started adding a product verification code to their equipment. This code can be verified on their website. But either my charger is a fake or there is some problem with the verifications system. My label has 3 groups of 6 digits, on the website you have to use 4 groups of 5 digits? 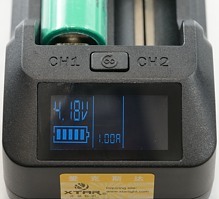 The charger can handle 70 mm long batteries, inclusive flat top cells. Below 2.0 volt The charge current is between 2 and 3 mA. Between 1.5 volt and 2.0 volt the battery symbol will flash. Between 2.0 and 2.9 volt the charger current is about 42mA/42mA/72mA in the 3 current ranges. Above 2.9 volt the regular CC/CV is used, see curve below. Without power if will discharge the battery with about 0.5mA. With power it will charge with about 0.5 mA when the battery is full. The voltmeter can show voltages above 4.20 volt, but lock up and will not update anymore, before voltage is below 4.20 volt again. The voltmeter will only be enabled with battery voltages above 1.5 volt. 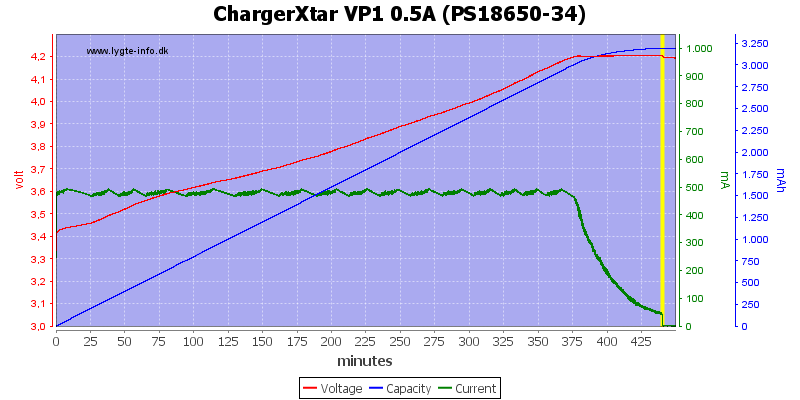 Charge will restart if battery voltage drops to 3.9 volt. Because each channel is independent, the different voltages varies between the channels with a small amount. 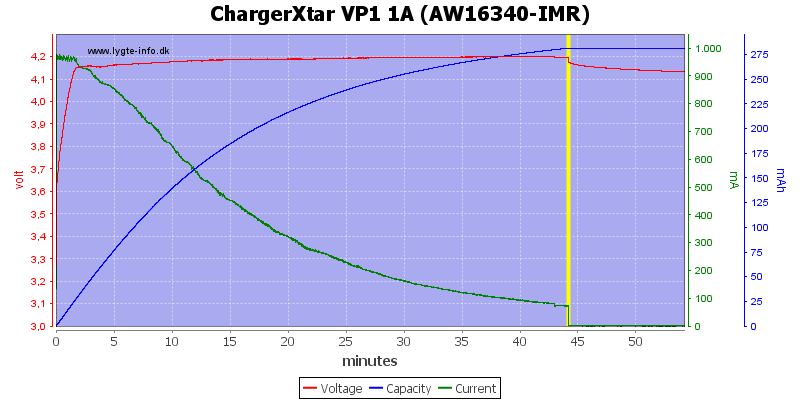 The first charge curve is at the lowest charge current, it is a perfect CC/CV charge with termination at about 45mA. This is good, but a slightly lower termination current would have been better. Increasing the current to 0.5A, does also give a perfect CC/CV curve. The termination current is again about 45 mA at this current it is very good. 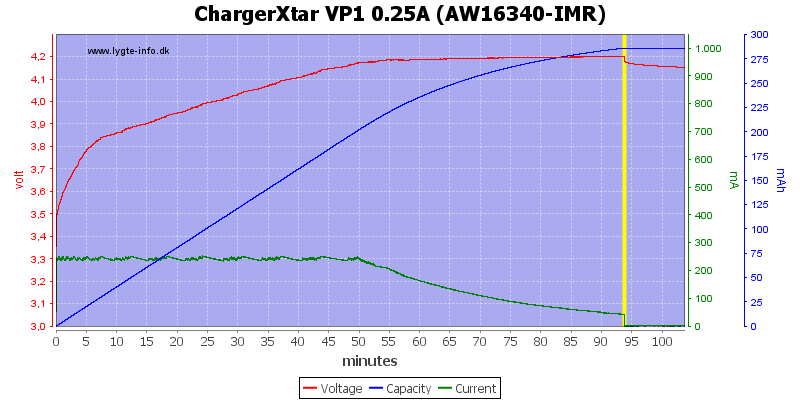 Same at 1A, notice that the termination current is increased to about 75mA, again a very good performance. The second channel looks just as good as the first channel. Running both channels at the same time, does not change the curve, i.e. the channels are independent. A 2600mAh battery will, of course, charge faster. A smaller battery, works just as well. My old worn down 16340 IMR cell is charged just as nice as any other battery. One more try with the old 16340 cell, this time at 1A (Some other brand told me that this was not allowed with their charger). With the VP1 there is no problem, it is just charged with a good CC/CV. That it is a old worn out cell can also be seen on the voltmeter, the voltage will drop significantly within a couple of minutes, when the charge current is stopped. When the charger is powered on, it will use some time to initialize, then the current will be slowly ramped up to the full charge current. It is possible to change the charge current before it starts charging, but because it always power up at 0.25A it is not required. It is also possible to change the charge current during charge. Here is a voltmeter test, while charging at 1A. There will be some voltage drop in the connection to the battery, this also means that the error will be less at lower charge currents. This charger does a perfect CC/CV, making it a fast charger or at least as fast as possible without cheating. With currents from 0.25 to 1A it covers many of the common batteries sizes, only exception is 26650 batteries and with a piece of tinfoil it is possible to charge one in the charger. I like the voltmeter, this makes it easy to see the charge state and also possible to spot a worn down battery. I could have wished for a better "finished" indication and I would also like a large range on the voltmeter, say from 0.00 volt to 4.35 volt. I will rate this charger as very good. Is this charger better than SP2? 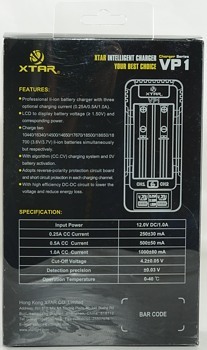 The charging is about the same, the advantages are from the voltmeter and from the lower charge current. The voltmeter is a nice feature for me, I am too lazy to check with a voltmeter each time I charge, now I can just look at the display. 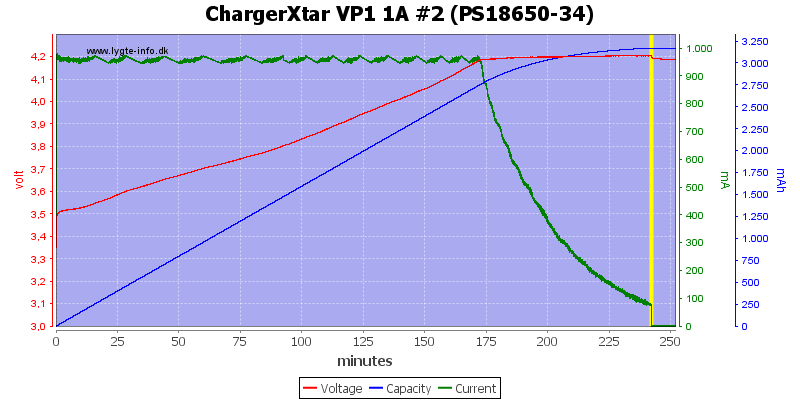 The 0.25A current makes it possible to charge 10440 cells and is slightly better for 16340 and some 14500 batteries. 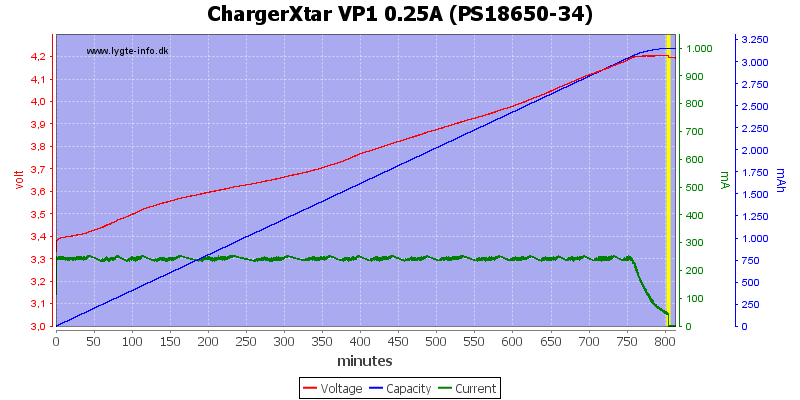 For me this makes the VP1 slightly better than SP2 and it will replace my SP2 as my most used charger. For people that wants 4.20 volt on their batteries, this is not the charger, this charger uses the correct algorithm and the battery voltage will drop slightly below 4.20 volt when the charge is stopped. I did all the tests at 110 VAC, because I bought the charger from US and got a US power supply. Great review HKJ! One typo though. I was glad to see no surprises as I ordered one yesterday. This will replace my SP2. I hate staring at those red LEDs, not knowing what the state of my charge is. Will the power supply from my SP2 work with the VP1? That is the Danish way to spell see. I do probably have more typos. Great review HKJ. I was glad to see no surprises as I ordered one yesterday. This will replace my SP2. I hate staring at those red LEDs, not knowing what the state of my charge is. The led has one advantage, you can easily see from a long distance if it is finished charging. Yes, but not the other way round, the VP1 charger cannot deliver enough current for the SP2. How is the build quality of the charger (feeling of the plastic thickness, tear-down, ..)? The charger feels solid, like the SP2 charger. Well, I love this charger. I decided to keep it side by side with my SP2 so all my charging options are available. 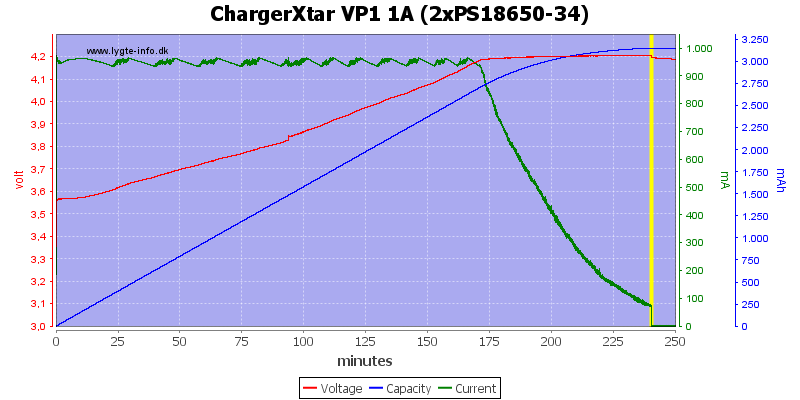 Every cell I’ve charged so far on my VP1 completed its charge at 4.20 volts, and when left in the cradle to rest after charging, came off at 4.19 volts. To me, that’s perfect charging. The Xtar website is pretty slipshod, and very poorly translated. 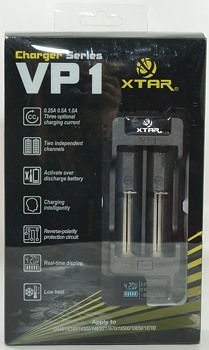 My VP1 is an official, legitimate Xtar product. …and don’t ask me how long I took figuring that out. Is there an indication of price? I didn’t see it on their page, probably just missed it. HKJ, the only other typo I saw that tripped me up a bit was “The slots has raised battery connections” ….with slots being plural has should be have. Nitpicking, I know….you did a great job! So where do I order this? And do I need to, with a Cottonpickers charger at 90/200 and another coming at 480/700? David’s voltmeter reads from 3-25V…nothings perfect is it? That could realistically be a little lower to see a highly discharged cell. Really enjoy your reviews HKJ, always informative and laid out in an easy to understand manner. A Big Thumbs Up to ya on this one! Is there an indication of price? I didn't see it on their page, probably just missed it. As far as I understand, they made a small run before the Chinese new year, they where sold at about $50. The next batch will probably be available sometime in March. HKJ, the only other typo I saw that tripped me up a bit was "The slots has raised battery connections" ....with slots being plural has should be have. Nitpicking, I know....you did a great job! So where do I order this? And do I need to, with a Cottonpickers charger at 90/200 and another coming at 480/700? David's voltmeter reads from 3-25V...nothings perfect is it? That could realistically be a little lower to see a highly discharged cell. Really enjoy your reviews HKJ, always informative and laid out in an easy to understand manner. A Big Thumbs Up to ya on this one! A cradle charger is safer to use, there is no risk of magnets attracting stuff and make shorts. A cradle charger is easier to use (As long a the batteries fit). 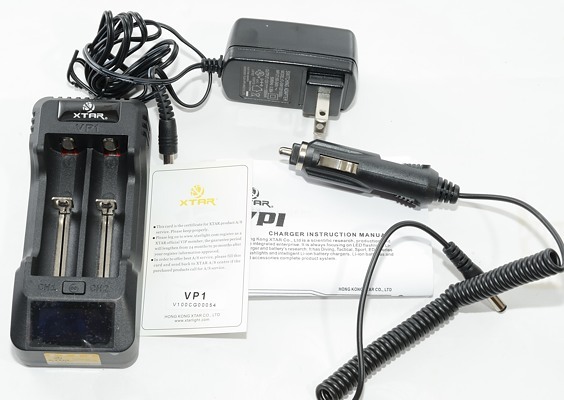 The voltmeter on VP1 uses much less current from the batteries, and it will not start discharge the batteries when charging is finished. I did have an issue with the two leads being the same length on my initial cottonpickers charger. The battery somehow rolled off the desk and let the leads clamp together while on charge! Got it nearly immediately but it inspired me to cut one lead down so they can’t easily do that again. Ever since then this charger tops off to 4.21V instead of 4.2V. Then I found that some cells don’t have magnetic bases, like the RediLast or the Ultrafire. So I found a tube that fit up to 18mm cells (I think it held an Epi-Pen) and cut some location holes in the sides. I put the negative lead into the hole at the bottom of the tube, slip the battery in on top of it, then put the positive lead in the hole at the appropriate location for the top of the cell, drop another cell on top of that to hold it in place, plug in the charger. The leads are isolated inside the tube so they can’t come in contact with anything else! This is not the charger, this charger uses the correct algorithm and the battery voltage will drop slightly below 4.20 volt when the charge is stopped. I bought one of these after reading this review. Well worth the money and every bit as good as the Pila I had been using with the added bonus of 3 different charging rates. Does the VP1 come with both the AC and DC charging cords? Mine came with the UK mains lead and a 12v car cord. In my pack it did and I just bought it from a shop. It depends on the set. XTAR makes a SET A and SET B. The difference is the inclusion of a DC charger. Set B with the charger is more expensive. Would it be possible to update this thread with a photo of the thermal imaging on the VP1 charger? It would be much appreciated. HKJ Would it be possible to update this thread with a photo of the thermal imaging on the VP1 charger? It would be much appreciated. I will try to get that done. Just ordered one of these from Fasttech for $31.25 using the BLF discount code. Looks like an awesome charger! Oh I forgot to mention, great review HKJ! All your reviews are very informative. Thanks!! no support for 16650?? Hum. 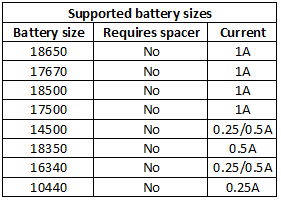 I cannot list all supported battery sizes, anything close to or between the listed sizes will work.